Besides my Puppet shows and puppet making workshops, I now have hand crafted puppet theatres and puppets for sale. Available to kindergartens, schools, anyone. Sometimes in stock, mostly made to order, so please allow a few weeks before it is required. (The white space at the front will be personalised with your details.) So far they can be found at Warragul Primary, Trinity Grammar, Williamstown Primary, and two at Glenroy Central Primary. 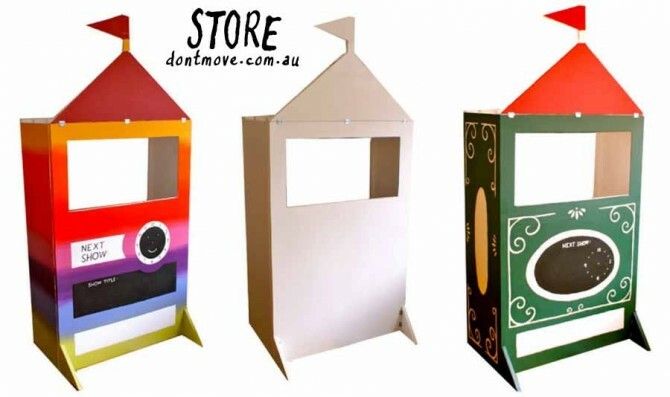 Three puppet theatre designs are currently available, ‘Rainbow’ or ‘White’. ‘Traditional’ is SOLD OUT. LIMITED EDITION: ONLY TWO THEATRES REMAIN, no more to be made! The theatres include a set of puppets and two simple bits of scenery to show ways students can create their own. One of these is designed as a front curtain. Designed for children from 3 -15 years and older. FULLY PORTABLE which means it can easily be taken from one classroom to the next. No loose parts (except scenery and puppets). Includes hooks inside to hang puppets and scenery, and also clips to place notes/scripts. Also includes blackboard paint on the front so that the time of show and show title can be altered as necessary. Delivered for free when a puppet show is booked, otherwise on arrangement. A full operating built in curtain that rolls up and down can be added at further cost (see below). ORDER HERE NOW via my CONTACT page. You can find it HERE at Bookworld.